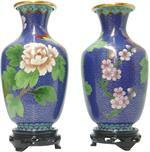 Item #11264: Pair of 10" Cloisonne vases with pink Chrysanthemum on a blue thousand flower design background and mounted on 1.875" tall carved wooden stands. Item #CL-347: 10" tall Cloisonne vase with green, yellow & pink cherry blossoms, black & white bird and a lavender rock on a Green background mounted on 1.375" tall carved wooden stand. Item #CL-353: 10" tall Cloisonne vase with with green, yellow & pink cherry blossoms, black & white bird and light blue rock on a green background mounted on 1.375" tall carved wooden stand. Item #11006A: Pair of 10" tall Cloisonne vases with pink and white cherry design on a cobalt blue background mounted on 1.875" tall carved wooden stands. Item #11003: Pair of 10" tall Cloisonne vases with blue and mauve chrysanthemum design on a cream background mounted on 1.5" tall carved wooden stands. 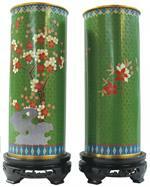 Item #11010A: Pair of 10" Cloisonne Vases with 1 5/8" tall carved wooden stands. 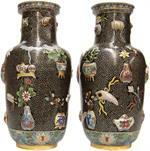 Item #E1003B: Pair of 12" tall antique reproduction Cloisonne vases with multi-color motif and black background. 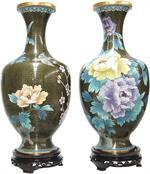 Item #E1003C: Pair of 12" tall antique reproduction Cloisonne Vases with multi-color motif and light Blue background. 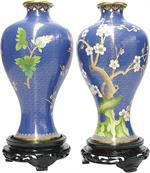 Item #11201A: Pair of 12" Cloisonne Vases with 1 7/8" tall carved wooden stands. 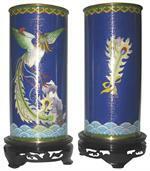 Item #11220A: Pair of 12" Cloisonne Vases with 2" tall carved wooden stands. 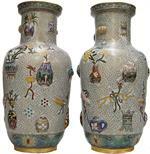 Item #E1001A: Pair of 15" tall antique reproduction Cloisonne vases with multi-color motif and turquoise background. 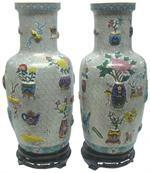 Item #E1001B: Pair of 15" tall antique reproduction Cloisonne vases with multi-color motif. 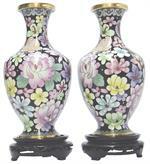 Item #11508: Pair of 15" tall Cloisonne Vases with approximately 2" tall carved wooden stands. 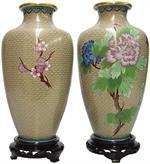 Item #11503A: Pair of 15" tall Cloisonne Vases with 2" tall carved wooden stands. Item #11508P: Pair of 15" tall Cloisonne vases with lavender, yellow & peach chrysanthemums with blue foliage, pink cherry blossoms and gray birds on an olive green with iridescent fleck background mounted on 1.875" tall carved wooden stands. 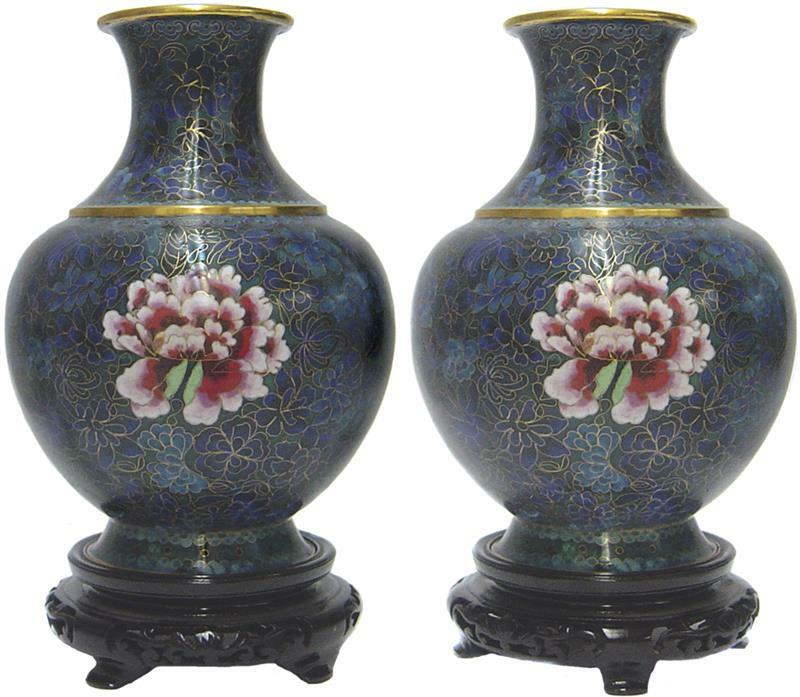 Item #E1005A: Pair of 18" tall Antique Reproduction Cloisonne Vases with multi-color motif and approximately 2" tall carved wooden stands. Item #CC-S3022312002: Pair of 4" tall Cloisonne vases with 3/4" tall wooden stands. Goldstone base with assorted colors. 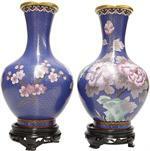 Item #10702: Pair of 7" tall Cloisonne vases with peach & mauve peonies and pink cherry blossoms on cobalt blue background on 1" tall carved wooden stands. Item #10708P: Pair of 7" Cloisonne vases with multi-color design in pink, lavender, peach, yellow and green on black background on 1.25" tall carved wooden stands. 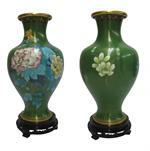 Item #1820: Pair of 8" Cloisonne Vases with 1 5/8" tall carved wooden stands. 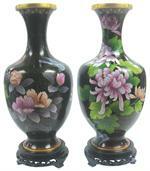 Item #1911: Pair of 9" Cloisonne Vases with 1 1/2" tall carved wooden stands.